Lee Edward Födi’s workshops are known for being educational, imaginative, inspirational—and fun! His sessions inspire and invigorate students of all reading and writing levels in grades K-8. Using PowerPoint presentations, Lee demonstrates how he finds inspiration for his books through drawing, map-making, prop-building, travel, and research. His sessions always include an interactive brainstorming component, so that each participant leaves with a visual output—and a broader understanding of such concepts as character, plot, setting, point of view, imagery, and style. Popular topics for the interactive brainstorming session are described below. Teachers can choose a specific brainstorming activity to include as part of the session; otherwise, Lee has a good guage for what activity fits well with what age group. In either case, no advance preparation is required on the part of the teachers. In this workshop, Lee Edward Födi showcases his collection of doorways from around the world and explains how this collection has inspired much of his own writing, including his new book, The Secret of Zoone. He leads students in an interactive brainstorming session in which they design their own doors and consider important storytelling questions. Students will then use this brainstorming as a pathway to writing a story or a scene. In this workshop, Lee Edward Födi delivers a presentation about his visual approach to writing fantasy-adventure stories, then works with students in an interactive brainstorming session, helping them create individual maps of a hero’s journey through an imagined world. These rough maps will serve as visual plot outlines for stories that student can write afterwards in class. In this workshop, Lee Edward Födi discusses his explorations of exotic markets in countries such as Egypt, China, Vietnam, Guatemala, Thailand, and Korea, and explains how these experiences have directly inspired settings in his fantasy worlds. He then leads students through an interactive brainstorming activity in which they imagine their own markets and all of the different strange foods and bizarre items that are available for sale. This activity leads naturally to an ongoing story project that can be continued in the classroom. In this workshop, Lee Edward Födi leads students in a discussion of famous enchanted vessels in mythology and discusses the inspiration for his own book, Kendra Kandlestar and the Box of Whispers. Lee then leads students in an interactive brainstorming session in which they imagine their own enchanted vessels. Students will then use this brainstorming as a springboard to write a story. In this workshop, Lee Edward Födi showcases some of his favourite trees from around the world. He then leads students in an interactive brainstorming exercise in which they design their own trees, imagining the seed that it might come from and what type of “fruit” the tree might bear. A natural story grows out of this activity and teachers can follow up on this afterwards, in the classroom. Growing up on a farm in British Columbia, Canada, Lee was subjected to various horrible chores such as cleaning up after chickens, pigs, geese, and younger siblings. He was often in trouble for his constant daydreaming. There was a time when his father harbored hopes that his son would take over the family business—but these aspirations came to an abrupt end when the young author accidentally plowed the tractor over his dad’s outhouse (thankfully, his dad was not inside at the time). As a result, Lee went on to pursue his love of art, mythology, and storytelling, all of which (luckily) do not require any skill in operating heavy machinery. He is the author and illustrator of the five-book series, The Chronicles of Kendra Kandlestar, which include The Box of Whispers, The Door to Unger, The Shard from Greeve, The Crack in Kazah, and The Search for Arazeen. His new series, Zoone, is being published by HarperCollins Children’s Books, starting with The Secret of Zoone in March 2019. Lee enjoys mythology, history, and the mysteries of the universe. During his free time, he is a traveler, adventurer, and maker of dragon eggs. He especially loves to visit exotic places where he can lose himself (sometimes literally!) in tombs, mazes, castles, and crypts. 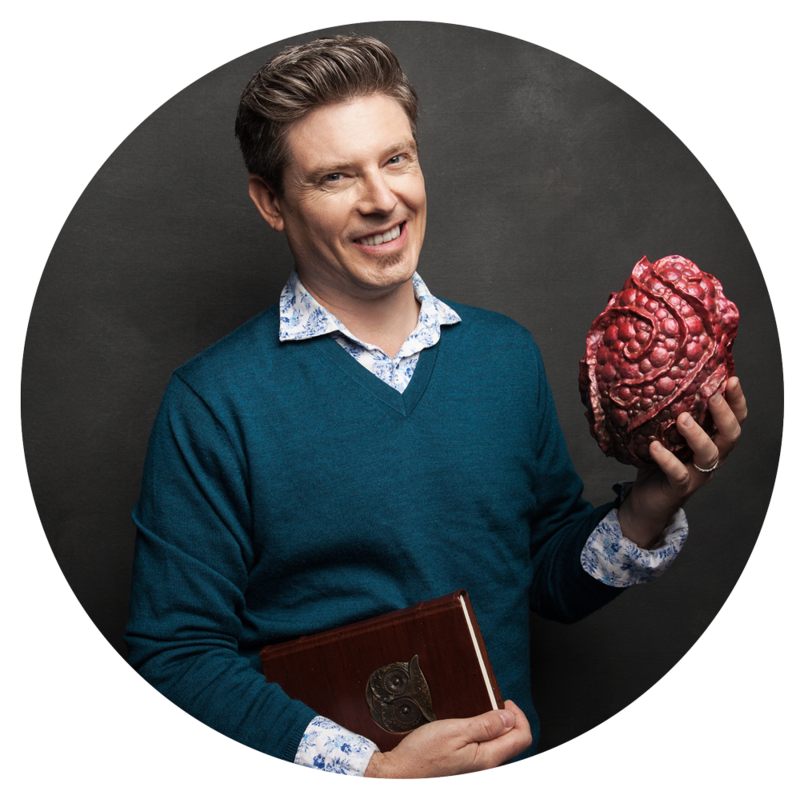 Lee is an engaging public speaker, specializing in presentations and workshops for children of all ages. He has taught programs in Canada, the United States, England, South Korea, and Thailand. He’s worked as a writer/artist-in-residence at numerous schools, including leading art therapy sessions for at-risk teens. Lee studied at the University of British Columbia and has a degree in English Literature and a diploma in Fine Arts. He is a member of several organizations dedicated to children’s literature. He lives in Vancouver with his wife Marcie, son Hiro, and unhelpful cat Griffin. “Lee Edward Fodi has presented at both the schools I have worked at the last two years. Most recently, he came in for 2 days and did 6 sessions with different grade groups, ranging from kindergarten to grade 7, on brainstorming and the writing process. In these sessions, he modelled idea generation and development using sketching and brainstorming in which students collaborated on a group idea, as well as produced their own idea. Students all walked away with either a story starter, an idea, or a mapped out story plan, which they were so excited about and could bring back to the classroom to use for a writing activity. Both teachers and students left the library telling me how much they enjoyed the sessions. Lee is a very engaging speaker, and was able to keep everyone from K-7 totally engaged all the way through. He was happy to speak to large groups in the gym, or to small groups in the library, and students of all ages were equally involved in both styles. Even with the large groups, he did a writing/drawing/brainstorming activity with all grades which everyone was engaged in and many students collaborated on. He is a very capable instructor, and is able to manage behaviour and participation with many sizes, ages and types of groups. He talked about his books as well, which students were very interested in, but his focus was very much on the creative process, on the patience and practice it takes to get good at writing and illustrating, and on where his ideas come from. “As a local author and illustrator, Lee has been leading workshops at our school for the past 10 years. During my first year at this school, I was informed that he would be joining us in the spring for a writing workshop. I made the decision to start reading one of his novels, Kendra Kandlestar and the Box of Whispers, to my class of six- and seven-year-olds. My students quickly became engrossed in the story and soon began writing their own Kendra spin-off stories, drawing Kendra pictures, and playing Kendra-themed games at recess. When the time came for Lee to visit our class, the students felt that they were meeting a celebrity. It was amazing for them to hear about all the things that inspired him in his writing, and to learn about his creative process as both an author and an illustrator. Lee proved to be not only a gifted writer, but passionate speaker as well. To say that the students were inspired by his workshop would be an understatement.